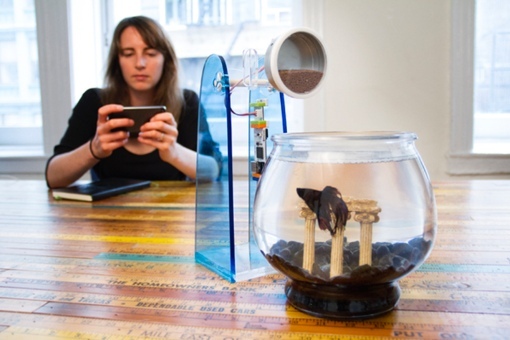 remote fish feeder, controlled by your smartphone. Do you ever look your friends’ smart thermostat and other connected home appliances with envy? Have you ever looked at one of your “dumb” appliances and thought to yourself, “man, I wish there was a simple way to make that thing smarter?” Do you like rolling up your sleeves and working on craft projects? If you answered yes to these questions, you should definitely check out littleBits Electronics’s new offering, cloudBits. Billed as a “simple way to learn and prototype with electronics,” cloudBits are tiny modules that let you create simple mechanical and electronic devices that connect to the Internet. No soldering or advanced programming know-how is required – if you can use the simple IFTTT automation app, you already know how to control cloudBits. On its most basic level, cloudBits convert remote commands and data into physical action, and vice versa. For example, you could move a simple cloudBits lever any time you send it a text command. You could get even more fancy, connecting the lever to a weather forecast or timer via the IFTTT app. It’s up to you to figure out how to turn the movement of that lever (or the other simple littleBits functions) into something useful, but that’s where the creativity and craft know-how comes in. Want some ideas to get you started? The littleBits website has a number of sample projects you can undertake with the new module, from a remote sensing chicken feeder (video below) to a doorbell that notifies you by SMS message whenever someone pushes it. There are even some fun projects you can do with your kids – one 8-year-old created a model of the Audrey II plant from Little Shop of Horrors that vibrates when you send it a text message. Each cloudBits module costs $59, and will need to be paired with a larger set of littleBit modules. A starter kit that includes the cloudBit runs $99, with even larger kits available for home and classroom use. The devices are available online through littlebits.cc and at RadioShack stores starting in August. For more cool projects you can do with littleBits and cloudBits technology, check out the company’s cool new NASA-designed ‘Space Kit’ toy for teens. I bought the cloud starter kit, probably the biggest waste of $100 ever spent. No tutorials or projects are included. The website doesn’t give any instructions whatsoever - they leave it to a community of techies instead that can’t relay clear instructions to normal people - and focus more on marketing and upsellng new bits. The whole process leaves non-programmers or learners hanging. Definitely would not recommend to anyone unless I want to frustrate them to no avail.